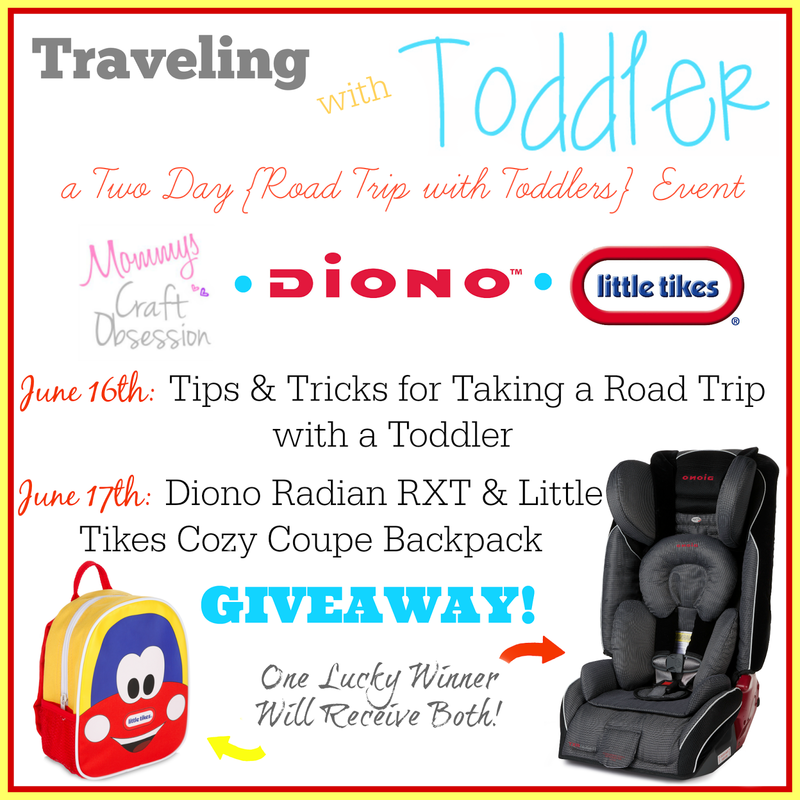 Diono Radian RXT and Little Tikes Cozy Coupe Harness Backpack Giveaway! It’s summertime! Schools out, the heat is in, and the family vacations are about to commence! Will you be traveling with a toddler this summer? Will you be taking a road trip? Welcome to the Traveling With Toddler Two Day Road Trip Event! Hosted by Mommys Craft Obsession and Sponsored By Diono and Little Tikes! Summer is the perfect time of year to hit the open road and travel with your family, but making your plans and heading out on your journey can be a stressful experience! Whether your road trip be three hours long or 24+ hours long, some of the most important tools to a successful trip are a quality car seat, space saving solutions, and the biggest – patience. This summer, Mommys Craft Obsession has teamed up with Diono and Little Tikes to bring you the ultimate two day event that will make your summer road trippin’ a much more enjoyable experience for the entire family! If you plan to hit the open road with your family this summer and are worried about how your toddler will handle the long drive ahead, Mommys Craft Obsession has put together a Tips & Tricks guide for taking a road trip with a toddler! After a 17 hour drive (each way) to California, Alex at Mommys Craft Obsession thought about what worked and what didn’t on their road trip, and wanted to lay out those tips and tricks in a handy guide, just for you! To read the Tips & Tricks guide, use this link! In celebration of summer and hitting the open road with your family, Diono, Little Tikes, and Mommys Craft Obsession want to give YOU the opportunity to win a Diono Radian RXT and a Little Tikes Cozy Coupe Harness Backpack! Together, the Radian RXT and the Cozy Coupe Harness Backpack make for the ultimate combination of a happy toddler on the road! To see a full review of the Diono Radian RXT and the Little Tikes Cozy Couple Harness Backpack, use this link! To Win: Mommys Craft Obsession, Diono, and Little Tikes want to give one lucky winner the Ultimate Traveling With Toddler Bundle – a Radian RXT and Cozy Coupe Harness Backpack of their own! Enter the giveaway form below for your chance to win! The Giveaway will close late on the evening of July 1st. The winner will be chosen at random through Giveaway Tools. The winner will be announced both on Giveaway Tools form as well as notified by email and announced on MCO’s Facebook. Winner must respond within 48 hours of receiving their winner’s email otherwise they will forfeit their prize and a new winner will be chosen. The winner will have their prize sent to them by Diono/Little Tikes. Mommys Craft Obsession and other participating bloggers are not responsible for prize shipment. Must be 18 years and older. Facebook, Twitter, Pinterest, and Google are in no way affiliated with this giveaway. No Purchase Necessary. Void where prohibited by law. U.S. Residents Only. For any questions contact Mommys Craft Obsession. Mommys Craft Obsession did receive compensation or product in exchange for the promotion of this event. I like Shadow. It’s neutral, dark enough to hide stains, but not so dark as to get hot if it’s in the sun. I like the dark gray option best for my car although I know my daughter would go with the dark purple color. I like Shadow, thought plum is a close second! I really like the red color in the pictures but it isn’t an option on the select a color. Cobalt is nice too. I like the black and gray one! I like plum, but I would let my cousin & his wife choose, since it would be for them. They might prefer blue, since it’s a boy. I love the color Storm. They are all so nice!